You can keep it in the fridge for up to one week! 1) Process biscuits until fine. Add oatmeal, oats, melted butter and water. Process until combined. 2) Press mixture over base of a 26cm round tart pan, and bake for 15’ minutes at 170ºC. Allow to cool. 1) Sprinkle gelatin over the cold water and allow to stand for 10 minutes. Then add the hot water and allow gelatin to fully dissolve. 2) In a deep saucepan mix the milk, water, cocoa powder, cornstarch and honey. Turn the heat on to medium and cook, whisking constantly, until the mixture thickens and comes to a boil, about 10 minutes. Stir in the dissolved gelatin. 3) Remove from the heat. Add the chocolate and stir until melted. Stir in the vanilla and ground cinnamon. 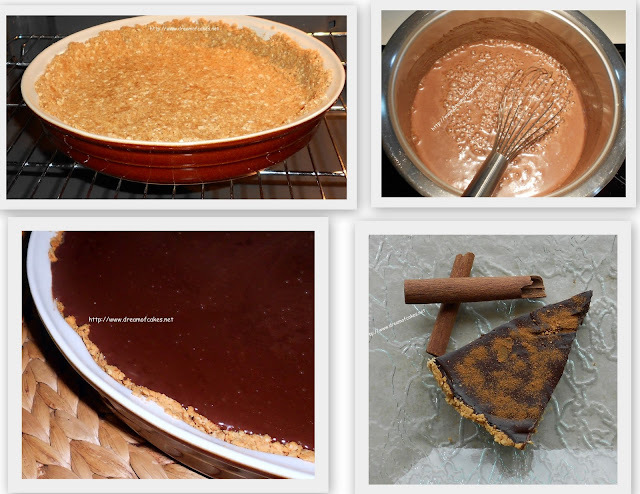 Pour the mixture into the tart crust and let set overnight in the refrigerator. Keep it in the fridge for up to one week? Efty, you are so sweet. In my house it wouldn't even make to the fridge! Great post! This is a perfect tart, you know...chocolate...and low calories...!!! I love the guilt free part,and it looks delicious. when you will creat a cake that makes you loose weight then you will be a billionair girl. A much healthier tart with less calories than a regular tart and still full of taste and flavour. My kind of dessert - double chocolate tart!! The only thing better than chocolate is DOUBLE chocolate! You have truly outdone yourself. Can't wait to try this out! A low-cal chocolate tart that keeps nicely for a week? What more could you want? Glad to find a delicious chocolate tart without all the fat. I think heavy cream is the naughty ingredient in most of them, so you did well here. If this tastes half as good as it looks, I would be happy-yum! This wouldn't last a week in my house! It sounds delish! This tart would be lucky if it even lasted a day in my house- an hour if it were lucky! Mmm vanilla with mountain honey and chocolate - yes please! This dessert looks to good to pass up, no matter how stuffed from dinner. The freshly ground cinnamon is key! Ευτυχία μου τι τέλειο που φαίνεται!!!! Και πολύ όμορφη παρουσίαση!! Μπήκε ήδη στα αγαπημένα μας!!! They are so delicious, I am very excited to find them in your blog. Dark chocolate provides a wide variety of both physical and mental benefits. In addition to providing a natural boost of serotonin, dark chocolate also offers antioxidants that promote good physical health. Chocolate maintains a reputation as an unhealthy food mainly because milk chocolate is more widely promoted and thus, more popular. Milk chocolate is cheaper to make and is more common, but recipes like this should be introduced to children at a younger age in order to help them a preference for dark chocolate versus the less healthy milk chocolate option. Dark chocolate is one of those few treats that actually have health benefits. Some benefits come from resveratrol,which is an antioxidant that is also found in red wine, among other products. It's mental health benefits include the ability to boost brain levels of endorphins as well as serotonin, which is considered a mood-altering chemical on which many antidepressants act.Dark chocolate also may increase serotonin production in the gut, and thus help strengthen the immune system.Among these benefits, it may help reduce blood pressure and increase arterial blood flow, reduce the chance of blood clots and lower bad cholesterol.